Medon28 (Vor 2 Jahren) #15715679i preordered it long ago,it's just that i like the color yellow which is why i would have preffered the prototype colors more. Just realized the most important character of on his face is missing from the proto type. Its the angry brows they are gone now...thats a bummer. Everything else is good tho..
tyt2lynnin1 (Vor 2 Jahren) #15715588I also fell in the same boat. Though the figures yes is different from the prototype, and yes the proto looks better somehow, but thats the point. Its a proto. They always make it look better somehow, thats how they get you to preorder stuff. But aside from that this figure according to my naked eye and others on youtube, is the best version of Vegeta avaliable. No matter how different. Its way better than any past vegetas. The body, the face, the quality of sculpt looks way cleaner. The insectoid crotch doesnt look so bad and you will get used to it. In fact I perfer it this way now. Its more pose able! So id say still get it. Its hard to predict if this will sell well, but you can always wait since figuarts rarely sell out. i preordered it long ago,it's just that i like the color yellow which is why i would have preffered the prototype colors more. I also fell in the same boat. Though the figures yes is different from the prototype, and yes the proto looks better somehow, but thats the point. Its a proto. They always make it look better somehow, thats how they get you to preorder stuff. But aside from that this figure according to my naked eye and others on youtube, is the best version of Vegeta avaliable. No matter how different. Its way better than any past vegetas. The body, the face, the quality of sculpt looks way cleaner. The insectoid crotch doesnt look so bad and you will get used to it. In fact I perfer it this way now. Its more pose able! So id say still get it. Its hard to predict if this will sell well, but you can always wait since figuarts rarely sell out. Melebus (Vor 2 Jahren) #13881090Maybe I´m wrong but I believe it is the contrast of photos what mades them so different, the Premium color Vegeta is also very different in the photos compared to the result. Obviously Bandai takes photos that benefit the product, like S-E in the Play Arts Kai. 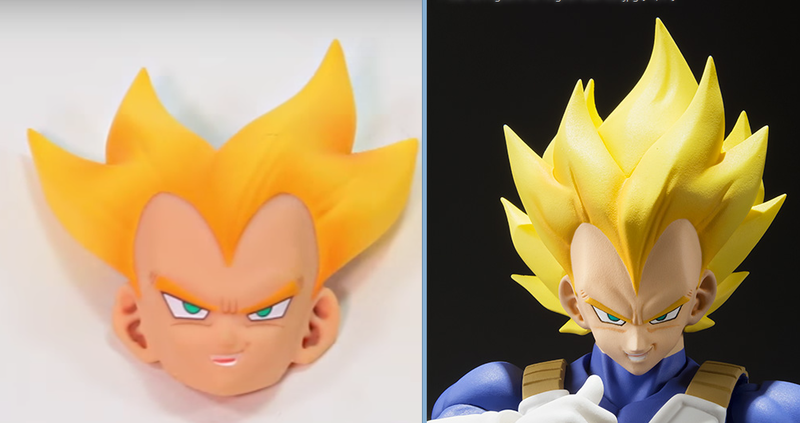 Maybe I´m wrong but I believe it is the contrast of photos what mades them so different, the Premium color Vegeta is also very different in the photos compared to the result. Obviously Bandai takes photos that benefit the product, like S-E in the Play Arts Kai.Medon28 (Vor 2 Jahren) #13879988what happened to the colors? GokaiSilver452 (Vor 2 Jahren) #11742204Like night and day. I really hope that Bandai continues to release vastly improved sculpts for previously made characters and ones not yet given the SHF treatment (no more super old Goku body reused for the millionth time! ).I'm hoping that they'll make a battle damaged Super Saiyan 2 Gohan during his battle with Cell. Specifically,the one with the final Kamehameha scene.